Viraj is in the corridor when he notices someone hiding. He calls out if there is someone. Surili steps out as he pulls her hand. She falls in his arms. He makes her stand. She apologizes to him. He asks her why she was hiding with the plate of food. Surili says I dint eat in the party and felt hungry suddenly. It is embarrassing. I dint want anyone to see but that only happened. She offers to clean it but he tells her a servant will do it. He takes her to kitchen with him. She relishes the food and thanks him. He pours water for her. She offers him a bite but he politely declines. She thinks to trap Viraj to make her plan successful. She thanks him for the gesture. Sitara asks the servant if she has seen Viraj. She is told that he is in kitchen with the new guest. Sitara hopes they don’t trouble him. Surili tells a fake story to Viraj and cries. Viraj gives her a tissue. She holds her hand and cries resting her head on his chest. Sitara comes just then and finds Viraj consoling Surili. Surili and Sitara look at each other. Sitara asks Surili what she is doing here. How can you behave like this with a stranger? Surili apologizes and excuses herself. Viraj tells Sitara she was only worried. Sitara reminds him he is a prince. No one can come this close to you! She walks out in a huff which puzzles Viraj. Next morning, everyone is gathered in the house temple for the morning aarti. Vrinda joins them just then. Rani Sa looks in her direction. Vrinda hypnotises her because of which Rani Sa utters the wrong Shloka. Vrinda says it correctly thereby catching everyone’s attention. Rani Sa wonders how she forgot the mantra suddenly. Ratan compliments Vrinda on not forgetting her roots even after being raised in abroad. He invites her for the aarti but Vrinda politely declines. Rani Sa also asks her to join them. I seem little lost. Please do the puja and give Prasad to everyone. She takes Vrinda with her. Sitara thinks her mother’s truth will come out in open the moment she will step in the temple. Chabeeli stops Vrinda just then. Didi cannot go in temple. It is due to monthly issues. Rani Sa lets go of them. She joins Ratan again for the puja and tells Ratan that Vrinda wont come here as she is unwell. Ratan says puja is already done. Let’s head for breakfast. Vrinda is trying archery. Ratan and everyone clap for her as she hits bull’s eye. Yamini’s husband compliments Vrinda. Albeli tells him that all 4 of them are very sharp shooters. Yamini stands between them. Ratan asks Vrinda from where she has learnt such good archery. Albeli shares that she keeps fruits over people’s heads and then shoots. She has a perfect score. Let’s do it here, Didi? Ratan is curious to see it live. Vrinda tells him not to fall for Albeli’s words. She exaggerates. Viraj also wants to see it. Surili also asks her sister to show her talent. Ratan asks Vrinda again. She tells him she will do it for his sake. Ratan decides to be her prey today. He picks an apple and stands in front of her. I will keep it over my head and you will have to hit the apple. Do you accept? Rani Sa and Samrat tell him against it but Vrinda accepts the challenge. Chabeeli tells Sameer her sister is the best just like him. I saw you exercising in the morning. My sister’s shot is as perfect as your body. Samrat falls for it. Viraj tells his Dad it is risky but Ratan stays put. Vrinda looks at Sitara. She mentally tells Sitara to see that her Rajasahab has chosen to become my prey on his own. Save him if you can. Rani Sa is worried but Yamini tells her he would have thought about it. Vrinda picks a bow and arrow. I was waiting for this chance since years. I wont let go of this chance now! Sitara worries for Ratan’s safety as Vrinda aims her arrow at Ratan. Vrinda thinks her revenge will be complete today. She shoots the arrow. Sitara holds it just before it is about to hit Ratan. Everyone looks on in shock. Ratan asks her what she did. Sitara asks her why only Vrinda is getting this chance. I am Minister’s daughter. I have learnt this since my childhood. It is very easy to aim when someone is standing. The real talent will be when you will walk and she will aim! I will ward off every arrow that will be coming towards you. It will prove her talent and my worthiness too! Ratan accepts her condition and so does Vrinda. Yamini’s husband shoots a bullet to start the challenge. Ratan starts walking. Vrinda starts shooting arrows at Ratan but Sitara holds them off using her bare hands just before they are about to hit Ratan. She wards off all the arrows. Vrinda thinks Sitara is acting stubborn again. She comes to save them every single time! Rani Sa praises Sitara. Vrinda launches the last arrow on the ground thereby accepting her defeat. You are indeed talented and a real protector of Ratan ji! Very proud of you! Sitara asks her if she wont give her any prize. Vrinda says I have given that already. It is your turn to find it. Don’t shift your focus. Focus on the arrow. You will reach your destination on your own! Sitara looks at the arrows. In her room, Sitara paces wondering what Vrinda meant. Her game is turning difficult. She called me Arjun telling me to focus on the eye of the fish so I hit bull’s eye. Was there any hint in her arrows? She runs outside to look for a clue and finds the Hindi alphabet “Ta” reflected on the grass. She connects Sun and Ta (saint). Vrinda looks on. You found the second clue so soon. I regret the fact that you are my daughter yet you are standing against me but I am equally happy that you are smart and a brave warrior. I would have hugged you if you weren’t standing in my path today! Precap: Ratan welcomes a Saint in their house. He visits us every time. Vrinda and her sisters decide to kill the saint before he can find out their truth. They mix poison in his offering. The saint is about to drink it but Sitara takes the bowl from him and gulps it down. 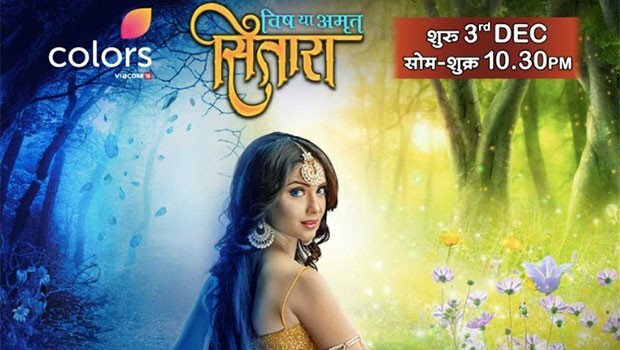 The post Sitara 4th March 2019 Written Episode Update: Sitara finds her next clue appeared first on Telly Updates.